Brazilians suffer from one of the heaviest tax burdens in the world. The situation is aggravated by the fact that almost 30 per cent of the workforce is to be found in the informal market, responsible for approximately 18.5 per cent of the country’s GDP. A heavy tax burden is controversial per se, but is infinitely easier to justify in a welfare state featuring an efficient public service and where safe citizens enjoy a solid infrastructure, quality public schools, healthcare and other social services. Needless to say, this scenario is very far from any Brazilian reality. South Africa spent a little over US$ 9 billion on infrastructure and stadiums for the 2010 World Cup. There are good indications that the costs for preparing the 2014 WC edition will be at least three times higher: an astonishing US$ 25 billion. And yes, we’re talking public spending. In mid July the German team Mainz will inaugurate their new stadium – the Coface Arena – with room for 34.000 spectators. The total cost of the top modern arena is US$ 88 million. In Brazil, considering arenas that will be either built from scratch or reformed for the WC, the reform of the “Arena da Baixada” in Curitiba carries the smallest price tag: US$ 138 million. With the above scenario in mind, perhaps it should come as no surprise that the aldermen of the São Paulo City Council today voted 36/12 in favour of granting tax breaks in the order of R$ 420 million – roughly US$ 260 million – to the football club Corinthians to help the club construct a US$ 500 million stadium. The already (in)famous Itaquerão, of “Fielzão” as it’s sometimes referred to, today remains as the city of São Paulo’s only hope to host the opening game of the World Cup. Disastrous planning (or rather the lack of) and political intrigues have led to this point of no return where apparently anything goes to “save” the city of São Paulo’s honour; even if that includes treating rules, regulations and licenses as mere formalities and pumping public funds into an entirely private endeavour. The loss in tax revenues equals the construction of 420 day care centres or 100 elementary schools. In regard to the Itaquerão, and now speaking from a palmeirense’s point of view, one thing is particularly striking: the absolute silence by which Palmeiras’ president and directors are treating the whole thing. One would perhaps expect that it would bother Palmeiras that one of their major rivals, through foul play and unholy political alliances, literarily are treated to the opportunity of the century to have their own stadium and all benefits (i.e. expressive revenues) that comes with it. But no; while Corinthians president Andrés Sanchez lobby the City Council (yesterday we even had Corinthian ultras “paying visits” to selected aldermen), Palmeiras representatives have been saying that the Itaquerão is “none of their business”. None of their business? Anyone dropping a line like that has no business representing Palmeiras, for all I care. There are sure to be many more chapters to this sad tale. Trust Anything Palmeiras to keep you updated. 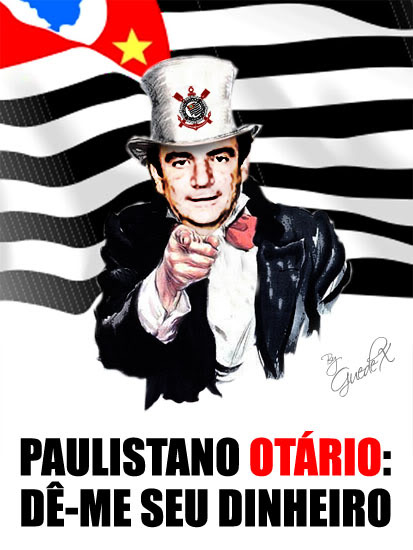 Andrés Sanchez to São Paulo's citizens: give me your money, suckers!